Clear incandescent bulbs vs clear LED bulbs - Lightcrafters, Inc. Trying to decide between LED versus incandescent light bulbs? For many years, since 1995, I have espoused the value of using clear incandescent bulbs. They work great in our punched copper light fixtures by putting pinstripes of light along your wall as shown in this beautiful mica and copper wall sconce made by Lightcrafters. Clear incandescent bulbs do a great job of casting light evenly in all directions. Shown respectively... Sylvania, Utilitech and Philips. Each work just about as well as each other and almost as well as clear incandescent bulbs. 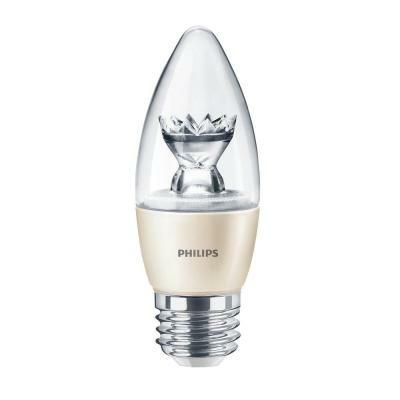 Due to the built in heat sink the LED bulb does not do quite as good of a job illuminating in a all directions, or 360º. Nonetheless, when two bulbs are used it is quite difficult to see the difference. Most will not notice a difference. I look for it. When you purchase dimable LED bulbs be sure to purchase the appropriate dimmer as existing dimmers switches likely do not control LED bulbs well. Ask at the store which dimmer to use or check with the manufacturer for specifics. Sticking with a reputable brand such as Lutron or Leviton is a good idea. The Ecosmart bulb, which is one of my favorites and readily available at Home Depot recommends using Lutron models CTCL-153PDH, MACL-153M, PD-6WCL,DV-600P or Leviton's models: 6674, 6672, 6631,6633. These quality dimmers will likely work all the bulbs, but do confirm this to avoid disappointing results.